Recent findings have identified that the url of your blog post can impact your Google rankings. Since WordPress automatically generates the post url, very few bloggers take the time to adjust the makeup of a single post url. It only takes a minute to optimize your post url, so I recommend that you do this with every new post. There are four things you need to know about optimizing your WordPress permalink structure for SEO. Backlinko did an extensive study that looked at the average number of characters in the url and the impact it has on Google position. The pages and posts with shorter urls dominated the top three spots in the Google rankings. Here is the break down of the average characters for the top five Google positions. Here is the chart visualizing the average character count for the top 10 spots on Google. The number of characters does not include https://. It starts with your domain, and it will include the www portion. 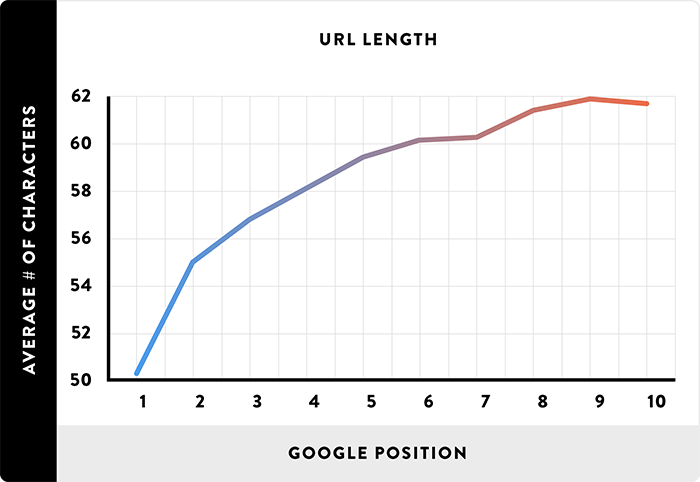 Google’s algorithm prefers shorter urls because they are easier to understand. My post with the title, “14 Home Office Ideas that Increase Productivity,” has the following shortened url. This url clocks in at 37 total characters. If I went with the automated WordPress url, then I would have been left with this. That would leave me with a character count of 67. On top of the Backlinko study, Google’s Matt Cutts had this to say on the topic. If you have got three, four or five words in your URL, that can be perfectly normal. As it gets a little longer, then it starts to look a little worse. Now, our algorithms typically will just weight those words less and just not give you as much credit. This could be the reason behind the lower character counts having higher rankings. If your target keyword phrase is on the tail end of a long url, then Google is essentially not seeing it. You want to be using the post name permalink format. You can adjust this by going to settings via the WordPress admin panel. Then click on “permalinks,” and that will allow you to choose post name. Here is a screenshot of the permalink section with the post name format highlighted. For every post title that I create, there is a core keyword phrase that I am trying to rank for on Google. If I used the default WordPress url, then my core phrase is going to be the sixth and seventh words in the url. Based on what Matt Cutts said, that would mean that Google would not even recognize my core phrase. That is why I manually adjusted the url to be..
Just to be clear, my title continued to be, “How to Create the Perfect Meta Description for SEO.” The url was the only thing that changed. Past post permalink edits should only be done by experts. My advice is to not worry about past posts. Just incorporate this process on future posts.